ad·verse [ad vúrss, ád vùrss] adjective 1. unfavorable: creating unfavorable, undesirable, or harmful results adverse conditions 2. antagonistic: acting with or characterized by opposition or antagonism adverse publicity 3. contrary: creating momentum in a direction away from that desired 4. botany facing stem: describes a leaf or flower that faces the main stem [14th century. Via Old French < Latin adversus "turned against, hostile" < past participle of advertere (see advert1)] -ad·verse·ly [ad vúrslee], adverb -ad·verse·ness, nounadverse or averse? Both words mean "opposed" in different ways. Adverse is normally used before an abstract noun such as circumstances or conditions when they are unfavorable or likely to cause difficulties: An adverse action was filed against him. 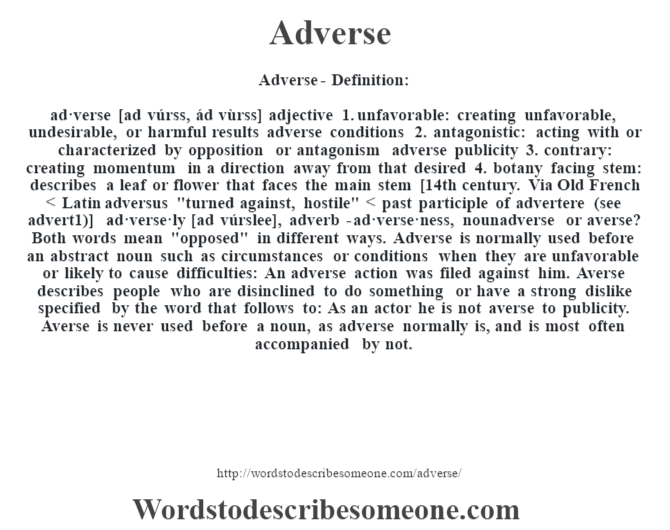 Averse describes people who are disinclined to do something or have a strong dislike specified by the word that follows to: As an actor he is not averse to publicity. Averse is never used before a noun, as adverse normally is, and is most often accompanied by not.